Welcome to the Christmas Blog Hop. 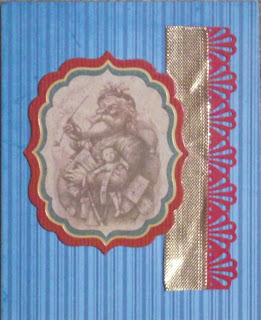 Today you will get to see more than 15 wonderful Christmas projects - cards, layouts, mixed media pieces. If by chance you just came by to see me please be sure to go back and start with our Hostess, Ashley at http://thebloghopprincess.blogspot.com to get the skinny on blog candy and sponsor prizes. For my project today I opted to make a simple card. I used a sketch from Always Playing with Paper, Merry Monday #1 and some chipboard for the Creative Card Challege over on Colorful Creations. Hope that you find all the inspiration you need to get your Christmas projects rocking! Thanks for stopping by! i love your vintage feeling card. Thanks for sharing! What a great card, I love working from sketches. Your card is adorable. I love the Santa. Thanks so much for sharing. Very nice card - thanks for sharing! Enjoy your day and thanks for the hop! What a pretty card! Love your take on the sketch! Love your card And some of my most favorite and pretty are the simple ones!! Great Job!! TFS!! Paula: I've heard about sketches but haven't really seen them; I really like your interpretation of the sketch & the vintage Santa. What a lovely, vintage Santa, Paula! Thanks for sharing with us at Merry Monday! Hope to see you back in January! Merry Christmas! What a pretty card. Great take on the sketch. Thank you so much for being a part of the hop. Great card, the vintage Santa is wonderful. Thank you for joining us for Merry Monday. Oh, this is one of my favorite Santa images! Wonderful colors and border! 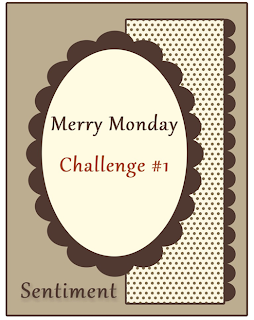 Thanks for playing with the Merry Monday challenge this week...see you next year!